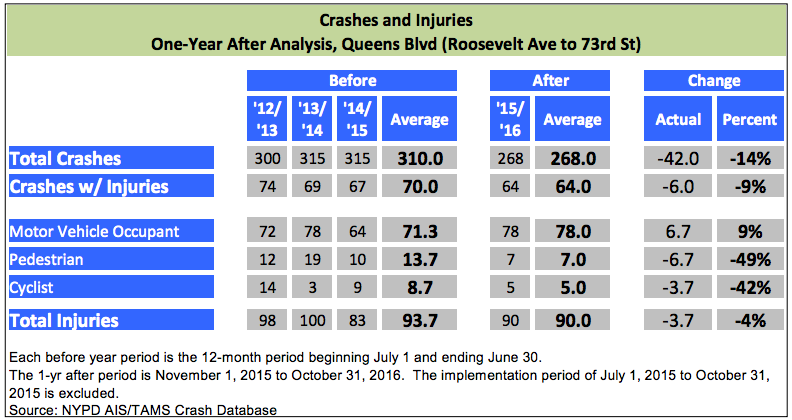 In the year after NYC DOT installed protected bike lanes and other safety measures between Roosevelt Avenue and 73rd Street in Woodside, pedestrian and cyclist injuries declined more than 40 percent, according to data DOT presented to the Queens Community Board 6 transportation committee last night [PDF]. Total crashes causing injury, including to car occupants, declined 9 percent. At the same time, DOT counts show the number of people biking on the corridor has doubled, according to a DOT spokesperson. DOT installed the first phase of safety improvements on 1.2 miles of Queens Boulevard in Woodside. Since that section was completed in the summer of 2015, pedestrian injuries dropped 49 percent and cyclist injuries fell 42 percent compared to the three-year average before the redesign. Pedestrians and cyclists accounted for all of the injury reduction in the project area. With car occupant injuries rising 9 percent, total injuries declined. The data doesn’t include information on injury severity, but another sign of success is that no people have been killed on the street once dubbed “The Boulevard of Death” since the city began redesigning it. Seven motor vehicle occupants were killed in crashes on Queens Boulevard between 2010 and 2013. DOT installed the second phase of the project this past summer between 74th Street and Eliot Avenue. Next week, the city will host its first public workshop on phase three, which will run from Eliot Avenue to Yellowstone Boulevard. Queens street safety advocates are hoping for a big turnout at the workshop, which begins at 6 p.m. at P.S. 139 in Rego Park. Update: This post has been amended to accurately reflect the increase in people biking on the corridor. Good to hear. I’m surprised though how short phase two will be. It only covers half of Queens CB 6. It should have stretched down to the Jackie Robinson Pkwy. And any news on the second phase of the Bruckner Blvd greenway in the Bronx? At this point I thought the DOT would have at least presented a plan. It’s useless until it reaches E 138th St.
I’m hoping they are just splitting Phase III for the sake of faster implementation. Perhaps later on there will be a Yellowstone to Union Tpke phase. We’ll find out on Thursday 1/12 @ 6p at PS 139. The number of people biking on the corridor has doubled, but how many people is that exactly? I fully agree with the need for the protected lane on this through route, but let’s at least disclose the number of people that are actually using it. Bravo to DOT 50 % reductions in injuries is remarkable. This is great news. The activists and the DOT officials who made this happen deserve a round of applause. I know they want to extend the lanes eastward down Queens Boulevard, but what about the section between Roosevelt Avenue and Skillman? It would be amazing if people in Forest Hills and beyond had a totally separate bike route all the way into Manhattan. And hopefully in the coming years, they extend it all the way down Queens Boulevard, and continue it along Hillside Avenue.